Genus: Scutia (Comm. ex DC.) Brongn. This species is accepted, and its native range is Ethiopia to S. Africa, W. Indian Ocean, India to China (S. Yunnan, SW. Guangxi). Shrubs or rarely small trees 2–5(–10) m. tall, usually scandent. Bole to 3 dm. thick; older trunks with thick dark corky longitudinally cracked bark; younger herbage and young inflorescences puberulent; branchlets angular, usually emerging at right-angles, numerous. Thorns prickle-like, recurveds axillary, solitary (but often 2 per node), 2–10(–15) mm. long. Leaf-blade, ovate to obovate, 2–6 cm. long, 15–40 mm. wide, at base rounded to cuneate, at apex (rarely slightly acuminate to) rounded (sometimes apiculate) or refuse or emarginate, always mucronulate, entire or in the distal two-thirds with a few (up to 9 on each side) indistinct crenulations or appressed teeth, on each side of midrib with 5–8 obscure secondary nerves; petioles 3–10 mm. long. Stipules 2–3 mm. long, quickly deciduous. Cymes often fascicle-like, 2–20-flowered (never more than 1 flower per cyme maturing fruit); peduncles 2–7 mm. long; pedicels l–2(–3) mm. long in flower, 2–3 mm. in fruit. Drupe 7–9 mm. long and thick, pallid when very young, ripening through red to purplish black; endocarps ± 6 mm. long, readily separating into 2(–3) free indehiscent stones. In a wide variety of situations from forest margins to bushland, thicket and wooded grassland; from sea-level to 2700 m.
Shrub or tree, usually somewhat scandent; branchlets glabrous or sparingly puberulous. Prickles up to 9 mm. long, recurved, in leaf-axils. Leaves opposite or subopposite; lamina very variable in size and shape, 2–6 × 1·5–4 cm., ovate or elliptic, apex acute to rounded or retuse, apiculate, margin entire to crenate, base rounded to cuneate, penninerved with 5–8 secondary nerves on either side of the midrib, discolorous in dry state, glabrous; petiole 3–10 mm. long, glabrous or puberulous. Cymes condensed; peduncle up to 7 mm. long. Flowers sessile or with pedicels 1–2 mm. long; bracts up to 1 mm. long, deltate, ciliate, glabrous or minutely tomentose. Flower-bud glabrous or minutely tomentose, sometimes puberulous only at apex. Sepals 1·5–2 mm. long, deltate. Petals 1 mm. long, deeply 2-lobed at apex, shortly unguiculate. Stamens with short filaments, slightly swollen at the base. Ovary 2-locular; style very short, obscurely 2-lobed. Fruit obovoid to spherical, up to 8 mm. in diam., glabrous. Seed pale, 6 × 6 × 1·5 mm., plano-convex. 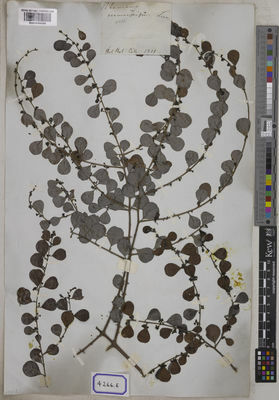 Scutia obcordata B.Boivin ex Tul. Ziziphus capensis Thunb. ex Poir. R.B. 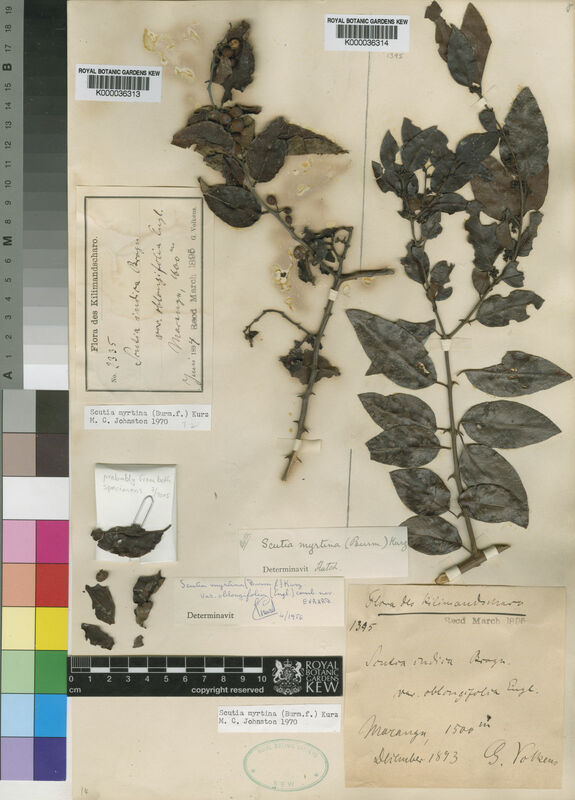 Drummond in Flora Zambesiaca 2:428, t. 89/A (1966). F. White, Forest Flora of Northern Rhodesia p. 227 (1962). Dale & Greenway, Kenya Trees and Shrubs p. 391 (1961). Evrard in Flore du Congo Belge et du Ruanda-Urundi, 9: 431, fig. 11 (1960). Verdc, in Bulletin du Jardin Botanique de l'État a Bruxelles 27: 358 (1957). W.J. Eggeling, Indigenous Trees of the Uganda Protectorate, ed. 2:326 (1952). Perr., Fl. Madag. & Com., fam. 123: 4 (1950). J.P.M. Brenan, Check-lists of the Forest Trees and Shrubs of the British Empire no. 5, part II, Tanganyika Territory p. 469 (1949). Kurz in Journ. Asiat. Soc. Beng. 44 (2): 168 (1875).